Who was this beautiful young lady standing there and talking to me so earnestly? I was sure I had just walked into some type of time warp. She wasn’t supposed to be like this. So tall, so pretty, so confident and sounding just like her mom. It went so fast. From crawling to being able to outrun most of her high school classmates in track. This was just too much. 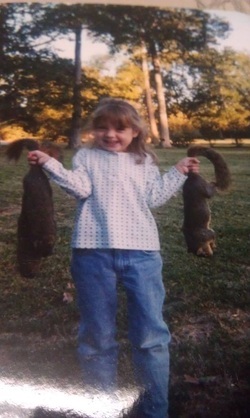 She was supposed to look like this and think that hunting with her Dad was the height of adventure. I suppose it didn't matter what I thought. There she was. Her new adventure was going to Florida to school. She had just graduated from High School and it was time to get started on the rest of her life. Papa she says,my Dad says all I need is a truck while I’m going to school. Yup, I said, your Dad is pretty smart. Should work for you till you need infant car seats. Well Papa, you have a truck and I want to buy it. She asked me how much I wanted and I told her. She told me how much she had and I told her “well happy graduation” and the deal was struck. It wasn’t all smooth sailing but when she got to this point it was all over but the shouting. The trip took a bit more. The trip was about 1200 miles so it was a relief that her mom was going with her. So long old paint. See you later Alex. We are going to have to go through the same thing next year but her sister is more inclined (at the moment at least) towards UT and sports sedans. I am certain that the pull at the heart strings will be just as bad but UT is closer than Fort Lauderdale. Also, I don’t have (or want) a sports sedan, so I doubt I will be very involved other than missing her. This driving attire is perfect. This truck has no air conditioner. If you read “Goodbye ole Paint” you know that it’s just an old work truck. In fact, this was probably the first time it had been clean since I owned it. Everyone has the motoring trip of a lifetime. I guess this may qualify as hers, for the moment. However, she has always seemed to have a sense of adventure. It won’t last long at the top of the list. It was all fun and games. Or was it. With more time we could have built a tonneau but she would just have needed to remove it when she arrived. Also, this was simpler. There is just something about a girl who is accomplished at using duct tape. If I had known she was this smart I would have taught her about JB weld and WD40. Oh well, probably learned from her dad. Well, maybe it wasn't all fun and games. When I heard about this I was happy that we had taken the time to go over changing a tire. That may seem simple but most vehicles are unique when it comes to changing tires. This truck was no exception. This was a fairly new tire with a warranty from a Texas company. But this is Florida. Rosa told me that they were going to honor that warranty with a reimbursement anyway. Way to go Discount Tire. When the trip was all over I'm sure it lead to a real sense of accomplishment. If not, certainly a sense of relief. I was impressed that Rosa and Alex took the trip like this in that old truck. They had hardly driven it before they took off. I think I am almost as impressed with what she did to the truck after she arrived. If I receive more pictures of the trip (and I may) I will include a slide show. Well the truck is gone and so is Alex. I think growing up is tougher on those of us who watch than those who do it.